Warning, this is totally off-topic. It has nothing to do with appliqué, and if you read this you will be subject to photos of fluffy little kitties. 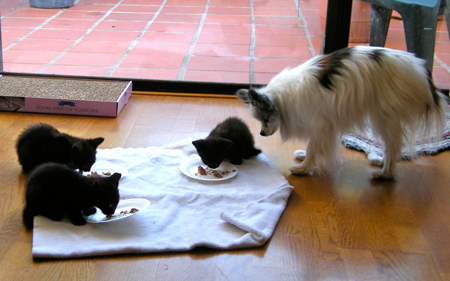 I may have mentioned before that In May I started fostering kittens for the animal shelter. 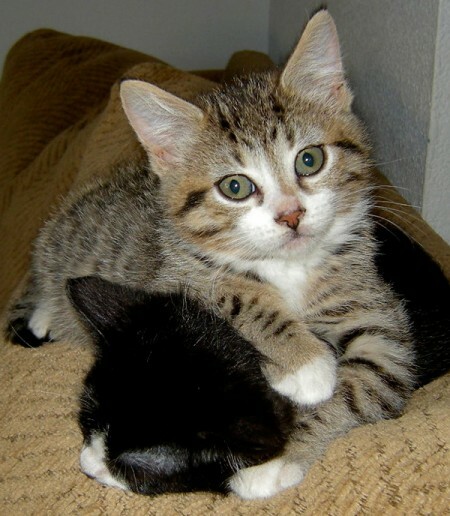 These are kitties that come into the shelter too young to be adopted out, who need some time being reared in a home until they’re ready. Over the summer and fall we had five different batches. The first three were all black. They look alike in this picture but actually there were subtle differences in their coat color and texture, so we could mostly tell them apart. 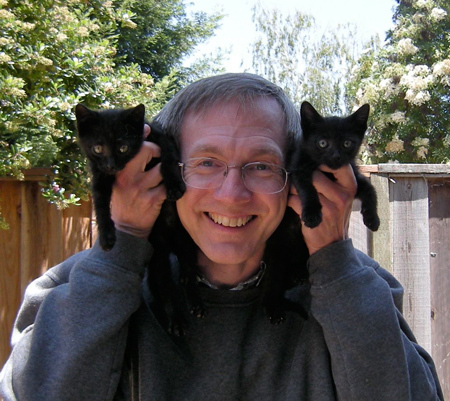 Starbuck (because he drank my coffee) and Thing 1 and Thing 2 (thanks Dana). BTW in the last post, somebody thought Dana was my son. No, he’s my husband with the Look of Eternal Youth. Willie was very gentlemanly with all of the little ones. 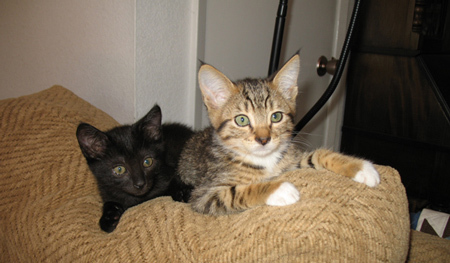 Batch 2, Riley and Tiger, came in shy and would run and play the livelong day, but as soon as any human moved, bam! they ducked for cover. They gradually got over that. I’ll never forget the first time that Tiger nerved himself to lie down with 30% of him touching my leg. 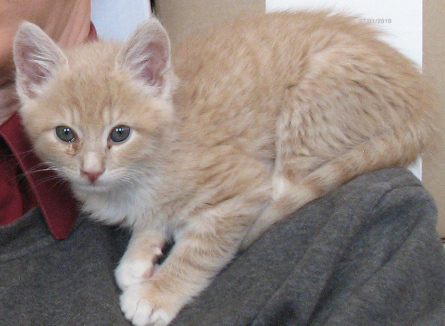 By the time they were ready to go back to the shelter he was crawling into my lap. 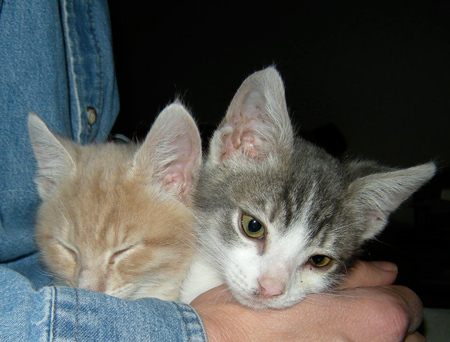 Batch 3 came to us with a case of URI (upper respiratory infection, like a cold for kitties). We don't feel that gud. 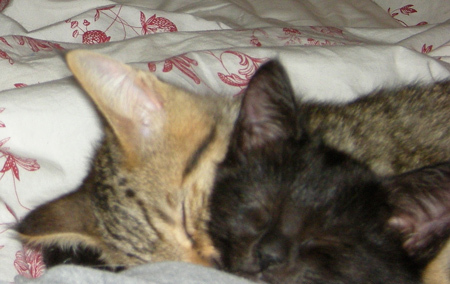 Bunny is the tiny tortie, who weighed a pound and looked like and felt like a dust bunny, which is why I named her that. The orange boys Buzz and Rufus were much more sturdy. Buzz was a champion snuggler and would come plop into my lap and purr like a buzzsaw. Rufus was more shy, but eventually he came around too. Nobody here but us tomatoes. 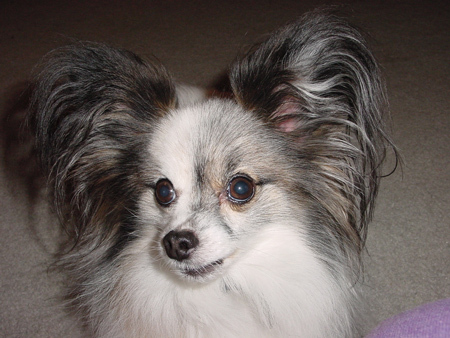 Bunny was our great success story and probably the one closest to our hearts. She really had us worried there for a few weeks, so tiny and frail, but she ate everything that wasn’t nailed down and finally one day she turned the corner and started to play and grow. She was adopted by a friend, and just look at her now!!! 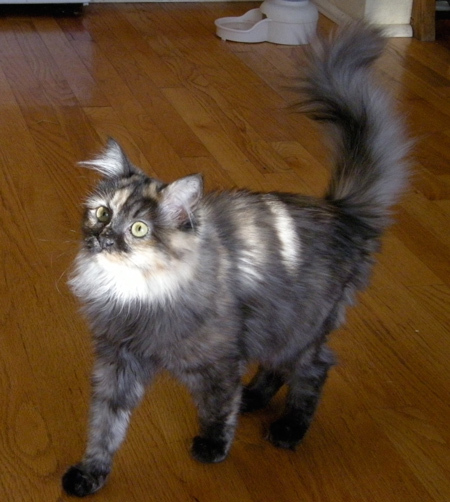 She is one gorgeous creature, with soft rabbit fur and a fluffy tail. 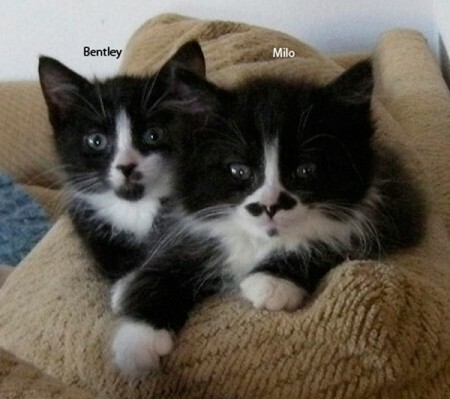 Batch 4 was one spotted tabby, Charlotte, and two tuxedo boys, Milo and Bentley. Bentley and Milo were always dressed and ready for an elegant party. 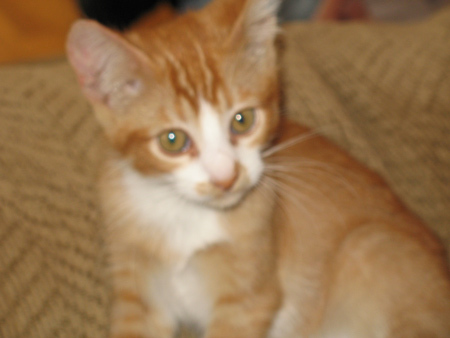 Milo was the runt of the litter but by the time they were all about 8 weeks he had just about caught up. 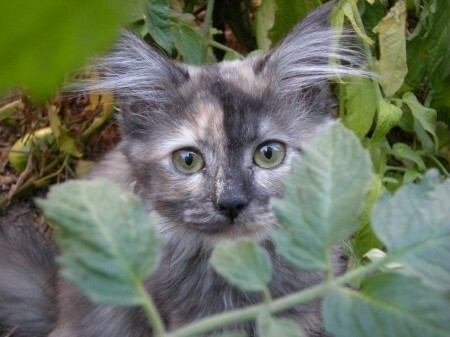 Pearl Grey came to us as a single kitty. She has a set of lungs on her like you wouldn’t believe, and a bit too much “catitude.” Here she is in typical fashion, spouting off about something or other. 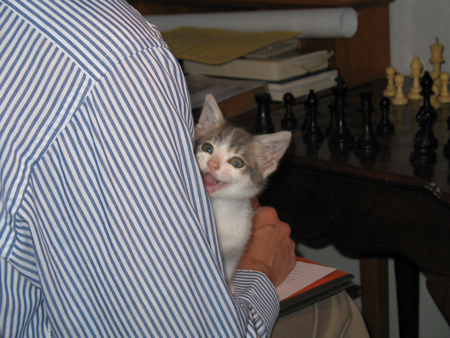 Dewey was sent home with us a week later to keep her company and teach her some kitty manners. He’s a buff tiger boy with a heart of gold. It worked beautifully. At first she was a beast to him but after three days they were BFF, joined at the hip, where one went the other went too. Dewey calmed her down beautifully. That’s the roundup! 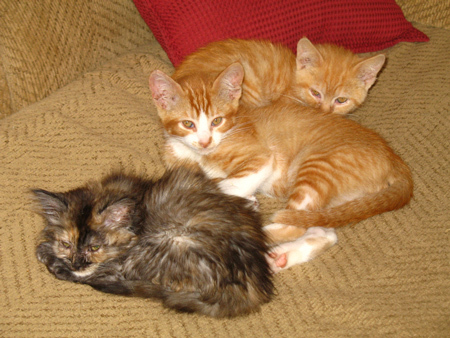 All have been adopted, and kitten season is over for now. 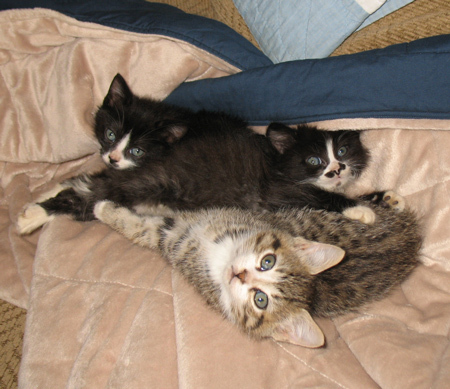 Thank you for allowing me to show you my fosters. I loved having them. I leave you with a couple of amusing videos of Pearl Grey and the Tail of Dewey. The winner of the Double Comfort giveaway is Janice Parker! Congratulations! 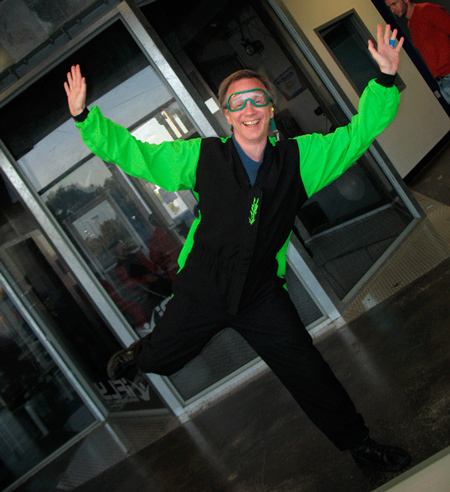 Dana on his birthday last year, preparing to go wind-tunnel flying. 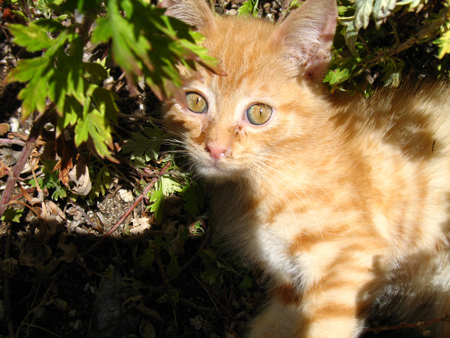 Willie a few years ago, more fringe-y than he is now. I wish you all a wonderful holiday week! I’ll be back on Christmas Day, when I hope you’ll forgive me for indulging in something completely off-topic. Welcome new visitors to All About Appliqué! You may be here as a stop on the QPM blog hop… if so, stay awhile and poke around! 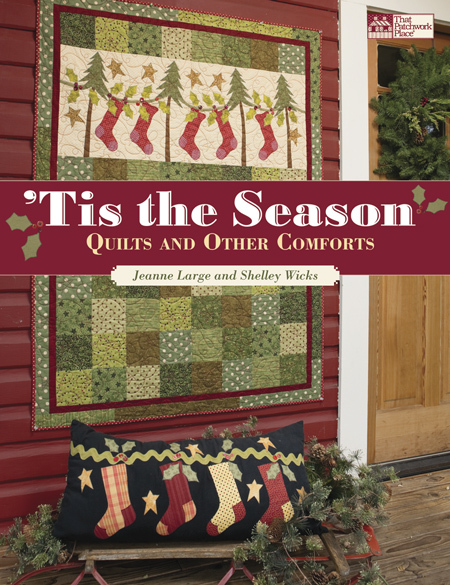 This is a great resource for any quilter interested in appliqué of any kind. Regular readers… Have you heard about the new online pattern magazine created by a quilter for quilters? Introducing The Quilt Pattern Magazine, debuting in January! 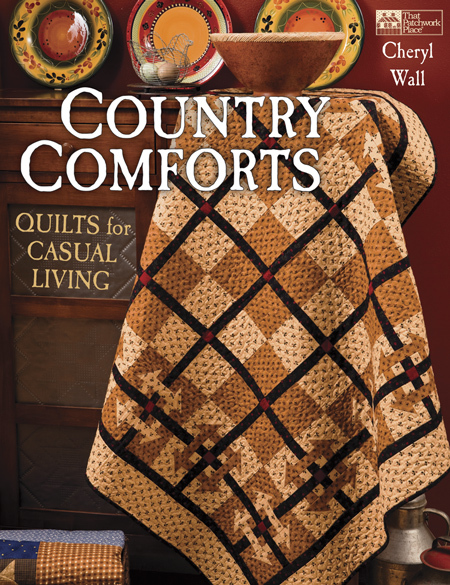 Cindy McCoy, the quilting brain behind QuiltCampus.net, is the publisher of this exciting new venture. 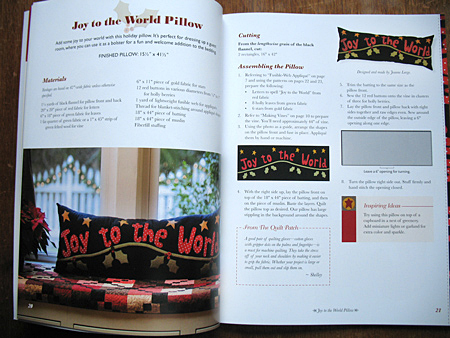 I’ve been watching this new publication develop since it was first announced, and when the sample pages went up on the website, I was thrilled to discover that the editor is a great chum of mine, Maria Hrabovsky of Maria Michaels Designs! I immediately submitted a short piece for the first issue of the magazine. It’s a review of Baltimore’s Country Cousins from AQS Publishing. 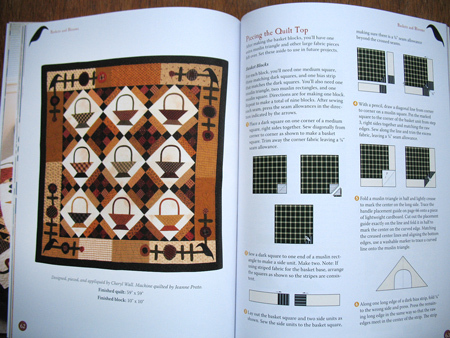 The cool thing about The Quilt Pattern Magazine is that since it’s online, there are no printing or shipping costs like those associated with other magazines. Subscribers will receive monthly issues with no less than five new patterns included in each. A subscription gives instant access to magazine issues from the day of their release to two months afterward. Save trees! Print only the pages you need. 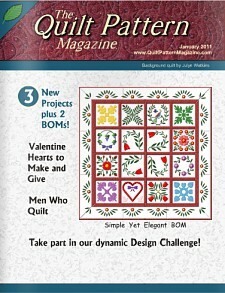 Would you like to win a free one-year subscription to The Quilt Pattern Magazine? Here’s what you need to do: Go to the magazine website right now and take a look around. Then come back here and leave a comment about it on this post. Here’s a link to the magazine that’ll open up in a separate window. Go! Then come back! Hey, great to see you again! Now comment here to enter the drawing. My winner will be announced during the first week of January. 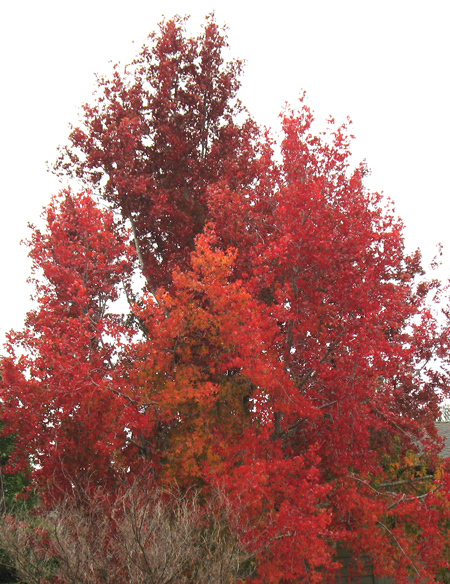 Who says we don’t have seasons here in California? The view from my studio. 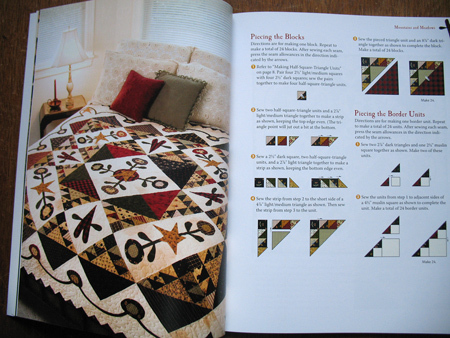 Random.org has declared that the two who receive Quiltmaker’s 100 Blocks first issue are Ruth C. and Deb Lester! Congratulations! Please email me (kay at kaymackenzie dot com) with your mailing address and I’ll get the magazines right out to you. See you back in a couple days for more giveaway goodness! 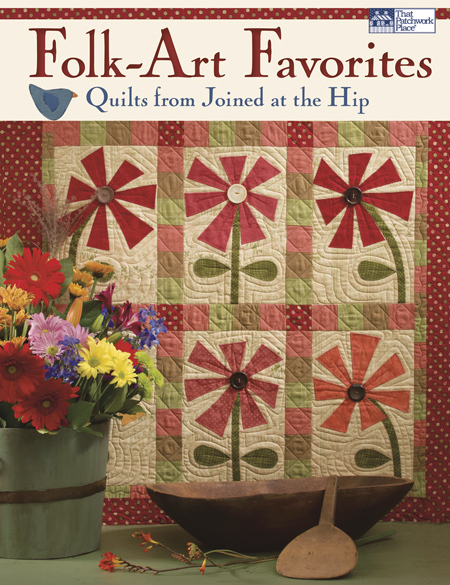 The winner of Folk-Art Favorites is Marcia Kosturock! Congratulations Marcia! Cheers. Enjoy the patterns. ‘Tis the season and ’tis said ’tis better to give than to receive. In that spirit I’m making it a month of giveaways! I was recently in dire need of a file pocket. I usually raid the DH’s office supplies but he was totally out, dang it. I searched my office, and my eyes lit on my collection of Magazines That Have My Stuff In Them, in the perfect file pocket. So I dumped them out for the moment, to deal with later. 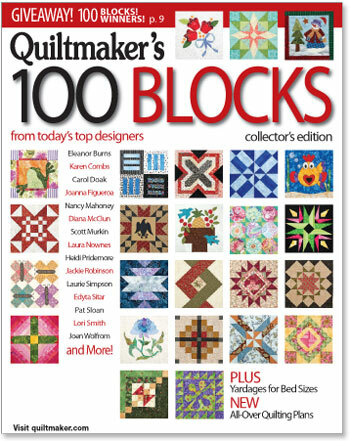 Later came, and as I was sorting through the stack I realized that I have four copies of the first issue of Quiltmaker’s 100 Blocks issue. I really don’t need four copies. I’m keeping a couple for the archives, and that leaves two copies that I can offer in a drawing. Here’s my block, Number 8. The second issue of this fabulous special publication is on sale now. I’m not in that one, but I submitted blocks for the third and fourth, and I’ll let you know about that when the time comes. If you’d like to win a copy of this first issue, leave a comment by 7:00 p.m. California time on Thursday, December 9. U.S. and Canada only. I’ll draw two winners. Those subscribed by email or feed reader, remember to click over to the blog itself to leave your comment. Then, on December 11, there’ll be another giveaway event! 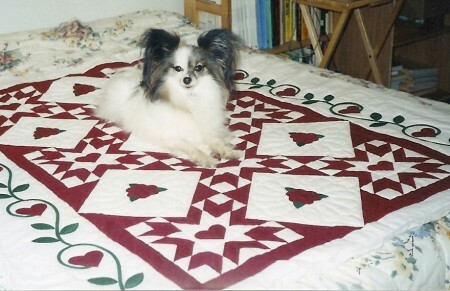 I’m participating in the Quilt Pattern Magazine blog tour countdown, so stay tuned for that as well! After that comes my birthday and I like to do something a little special for that too. Seasons Greetings fellow appliqué enthusiasts! 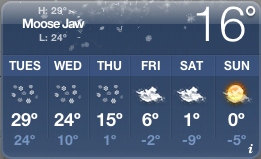 December is such a fun month. Let’s start it out with a festive book giveaway! A thoughtful present from That Patchwork Place to a lucky winner. 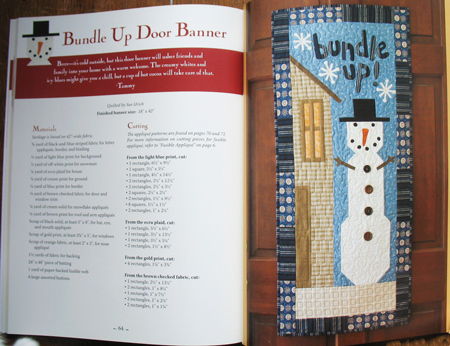 Our featured book this month is Folk-Art Favorites: Quilts from Joined at the Hip. Joined at the Hip is a design company specializing in folk art that consists of Tammy Johnson and Avis Shirer. Their husbands inspired that name for the company, as the men knew that between them they could always track down the quilting twosome LOL. When I think of folk art, I think of fun, funky, primitive shapes that are not necessarily the right size for one another, like a crow being way too big for the tree it’s sitting in. The Hip girls agree: “We are draw to objects that are out of proportion, whimsical, and offbreat.” Me too! 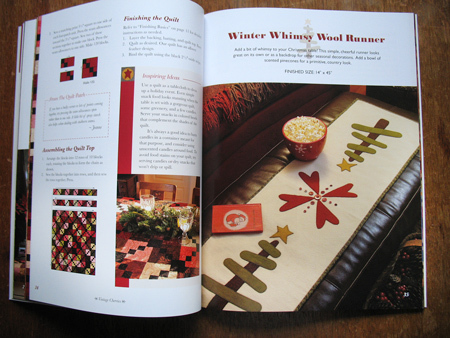 The authors begin by giving basic instruction in quiltmaking and machine appliqué, then dive right into the projects. If you’re a fan of that rustic, un-fussy look, you’ll love the designs from Joined at the Hip. 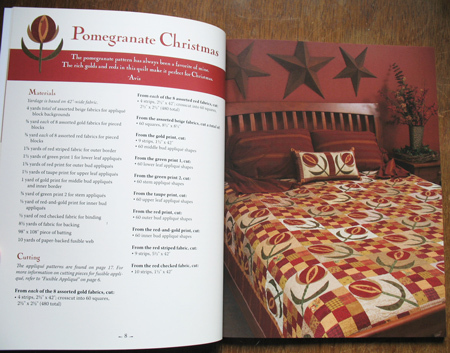 The pomegranate motif is always pleasing, here done in country holiday colors. This is one of four seasonal banners, the winter one of course for this time of year. To enter the drawing to win Folk-Art Favorites, leave a comment by 7:00 p.m. California time on Sunday, December 5. Those subscribed by email or feed reader, remember click over to the blog itself and scroll to the bottom of the post to leave a comment. Drawing open to U.S. and Canada only due to the cost of shipping.